GN MIDI Tools are Win32 commandline tools for analysing, converting, modifying MIDI files. The tools can be licensed for commercial or noncommercial uses. gnbatchexec is a tool that reads parameters from an .ini text file and converts all matching files found in the input folder into an output folder (including subfolders) by calling a specified commandline tool for each matching file. This tool can be used for the MIDI tools on this page and also for other commandline tools. It can call a tool for each subfolder or call a tool for each file that matches a list of given file extensions. gnbatchexec catches standard error output and writes it into a logfile. A progress percentage and current folder name is displayed during running. 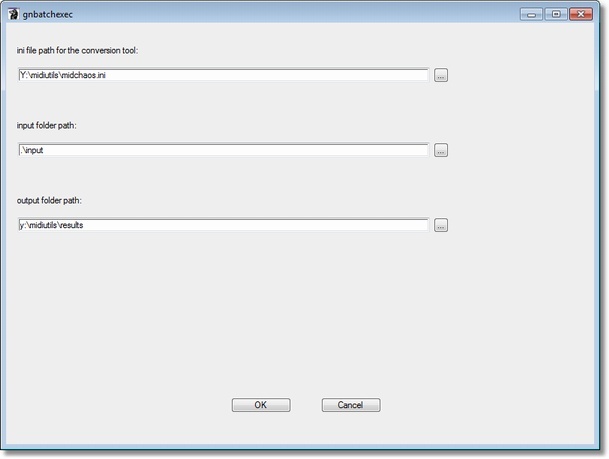 Option -dialog pops up a Windows dialog where the user can enter input and output folder. gnbatchexec is no demo. Distributing tool or license is probibited. Licensed permission for noncommercial use by Max Mustermann. midi2txt converts a binary MIDI file into readable ASCII text. The text can be modified and converted back to midi using txt2midi utiltity if the text syntax is still correct. This tool can be applied using gnbatchexec to many MIDI files (batch conversion). Using gnbatchexec no DOS commandline knowledge is required. -tact   marks end of tact bars with . -units  prints position of all events in midi units. -ms     prints position of all events in milliseconds (1st track only). txt2midi converts text converted using midi2txt utility back to a MIDI file. The text syntax must be valid. midi2csv converts a binary MIDI file into a comma separated text table. The rows are commands and the columns are parameters and additional calculated time information. csv2midi converts a text file generated by midi2csv utility back to a MIDI file. mid2parson reads the notes from a specified channel of a binary midi file and makes it mono. The remaining notes are converted to Parsons code which is often used to find parts from the song by a given search term that has not to be very exact (e.g. humming). midinote converts a binary MIDI file into a text file that can easily read by machines or software. Each line contains a MIDI command with values as parameters. The parameters contain also calculated times. The text file can be modified using a text editor and converted back to a MIDI file using utility note2mid. note2mid converts a text file generated by midinote utility back to a MIDI file. midimove moves MIDI commands of a binary MIDI file by a millisecond amount forward or backward. midimove is no demo. Distributing tool or license is probibited. midireplacetext replaces META text in a MIDI file. midisummary is a batch tool that generates HTML or text summaries of your MIDI files. Musicians who need to optimize their MIDI files need an overview to see if all is done correctly. Modifying MIDI files without enough content information could fail. This tool does not require commandline usage. All settings are stored in a text file. Running the same task again checks the existing summaries and generates summaries for new or modified MIDI files again. It can convert a list of input folders at once (including all sub folders). The tool can generate English or German (Deutsch) output text. It adds comments to controllers, programs and sysex (from a list of *.sysexdef files). It can generate a text or html file for each MIDI file or a merged text or html file for all MIDI files in a folder. midisummary.ini is used by default if no argument is specified. The options and folders are used from a .ini text file. A shortcut can be created to start the tool with a mouse click. A documentation of the possible options can be found here. midicat concatenates up to 50 binary MIDI files to play sequentially (e.g. medley). midicat "Better Run.mid" "Cold Ice.mid" "Better Run and Cold Ice.mid"
midimutt mutes tracks or channels of midi binaries. midimutt is no demo. Distributing tool or license is probibited. -silent=value           use silent value (0-127). Default is 0.
changes volume of the muted channels to value 20.
midistat collects statistic information from a MIDI file content. Without the > redirection it displays the information on screen. Using the > redirection the output can be written directly to a text file of given name. miditran modifies notes,velocity,volume by a given factor. At least one of the options -velocity, -volume, -note must be used. Operations: [+-=]value   (+ add value  - subtract value  = assign value). transposes the notes by 2 half tones except drum channel 10.
sets volume on all existing channels (1-16) to 100.
increments volume on all existing channels by 40 (same as -volume +40). midi1to0 converts a format 1 MIDI file to format 0. It merges all tracks to a single track that contains all channels. It is required for some keyboards or applications that require to use format 0 MIDI files. This program only converts format 1 midi files. You can try the format 1 to format 0 conversion using product demos GNMIDI and GNMIDFMT. GNMIDI Professional can also batch convert a directory including subdirectories. GNMIDFMT can also convert many files in a single directory. This tool can be used with gnbatchexecute for converting many files at once.